Comics in America have been on a 70-year sine wave, riding up and down in the public consciousness. Bursts of enormous success and popularity, followed by periods of dwindling sales and degraded quality, only to resurge again in connection with some new innovation or cultural paradigm shift. It’s been a bumpy and fascinating ride. American comic books got their start in 1933 with the publication of Famous Funnies #1 , a magazine-sized reprinting of Sunday newspaper strips. The new medium enjoyed explosive popularity and other publishers quickly hopped onto the bandwagon and soon began generating original content. The superhero was invented in the years leading up to World War II, with the likes of Superman and Batman dominating the so-called “Golden Age” of comics. Those old-world superhero comics seem antiquated and cheesy today, but back then they weren’t cliché — they established the clichés. Superheros started to falter slightly in the jaded post-war era. America was a little older, a little wiser, and more interested in grit over glitz. This paved the way for darker comics; crime, war, mystery and horror. The gritty wave was led by EC with popular titles like Weird Science, Tales from the Crypt, and Crime SuspenStories. Stories where the good guys weren’t always good and the bad guys sometimes won, just like real life, but distilled and clarified through the unique artform of comics. They were hugely successful. That all pretty much ended in 1954 when child psychologist Dr. Frederic Wertham published Seduction of the Innocent , a scathing indictment of comics, claiming the medium was almost wholly responsible for all forms of juvenile delinquency in the nation. 50s conservatism was so uptight that Wertham’s book even led to a series of highly publicized senate hearings, wherein comics — especially the horror and crime variety — were raked over the coals and blamed for most of society’s ills. The comics industry, facing the threat of government censorship, responded by voluntarily self-regulating with the establishment of the Comics Code Authority. The CCA effectively blacklisted the entire lineup of EC titles, apart from the subversive and brilliant Mad, which evaded the Code by switching to a magazine format. The Code was brutally strict and it became impossible to sell a comic on newsstands without the stamp of approval. Gone were the murders and ghouls and fast women. It was the first death of comics. Of course, comics didn’t really die, they just went dormant for a while. The Golden Age heros were still around, but the CCA doomed them to a life of wholesome blandness and teenaged sidekicks. EC had been scapegoated and crucified, and the other publishers scraped on through the end of the decade. Then in 1961 a struggling publisher changed their name from Atlas Comics to Marvel (after their first book published in 1939 when they were known as Timely) and in doing so changed the face of the industry. Stan Lee wanted to write the kinds of comics he wanted to read: heros with humanity, villains with motives, reflections of reality that were identifiable while still being escapist fantasy. The Fantastic Four was created as a knock-off of DC’s successful Justice League of America team comic. But the FF were different. They had problems, they squabbled, they had angst. It was a revelation in comics that revitalized the superhero genre and launched the Silver Age, with Marvel at the forefront. Their position was solidified forever with the first appearance of Spider-Man in 1966. The superhero rennaissance continued on into the 70s, coinciding with the youth-worship of the Vietnam era. But at the same time there was a cynical underground forming, fueled by mind-altering substances and bitter resentment of the establishment. The counterculture of the late 60s craved their own comics, not as showy as the mainstream superheros, and with a different breed of angst. 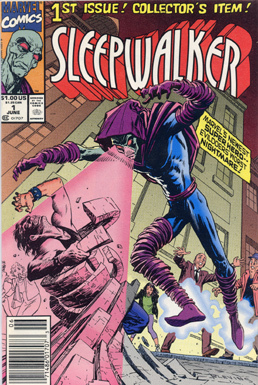 Comics were gradually developing a consciousness, but the mass market titles were still too timid to address sensitive issues in a forthright manner (with the notable exception of the Green Lantern, who got downright edgy for a while there). By the late 80s comics were starting to stagnate again. All the really cool stuff was happening underground while the mainstream publishers continued to churn out popular-yet-predictable superhero fare. The lid blew off again in 1989 with Tim Burton’s film version of Batman, largely inspired by Frank Miller’s reinvisioning of the character in the graphic novel Batman: Legend of the Dark Knight . The bat got back to his sinister anti-hero vigilante roots and the movie was a massive blockbuster, so suddenly a lot of people in suits started paying attention to comics again. It helped to spark the collecting craze of the early 90s, which would ultimately lead to the second death of comics. With money to be made, the big publishers (i.e. Marvel and DC) flooded the market with special issues, crossovers, limited series, and platinum-foil-stamped limited-edition gatefold covers. Fans were buying multiple copies of every book, convinced that some day they would be worth something. New titles appeared weekly just to flood the market with desirable first issues. At one point Spider-Man appeared in 4 monthly series, the Punisher in 3, and I can’t even count the number of X-Men spinoffs. The primary audience was no longer prepubescent boys, but college geeks and teens convinced that comics were an “investment” and were hence eager to spend their disposable income on the latest titles by their favorite star artists. The gimmicky glut would eventually crush the comics scene under the weight of its own popularity. The emphasis on flash and sales over substance and quality meant that the comics, though gorgeous, were pretty shallow. The craftsmanship just wasn’t there, and in the end it’s good characters with good stories that keep loyal fans coming back for more. Comics started to die again. The fanboys grew disillusioned when their copies of Torsoman #1 with the hologram cover failed to appreciate in value because 3 million other fanboys had the same one. The star artists fled Marvel’s assembly line hero factory to seek greater creative freedom, which they exercised by pretty much duplicating what they had already done, just with prettier pictures. As comic book shops closed their doors nationwide, Marvel faced impending doom and was near bankruptcy when ToyBiz snatched them from the fire with a buyout. The bubble had burst and comics haven’t yet recovered. Today, pop media is dominated by movies, video games, and the Internet. The kind of visceral adrenalin fantasy that comics delivered so well for so long is now better captured through superior technology and special effects. The giddy excitement is so much more impactful when Spider-Man swings across a 40-foot screen at high speed than when he crosses a static panel filled with motion lines. The blockbuster success of the X-Men and Spider-Man movies have put comics back in the public eye, but now simply as pre-tested source material for a Hollywood hit-machine industry with a serious originality deficiency. Despite the fresh attention, mainstream comics are still pretty lame, desperately trying to capture that movie sensation. The good stuff still comes from the underground, though DC made a smart move near the end of the bubble when they launched the indie-vibed Vertigo line, flagshipped by Neil Gaiman’s magnificent Sandman . As has been true since the 60s, innovation happens in black and white. Hollywood has translated some independent comics onto celuloid (The Crow, Ghost World, From Hell, Road to Perdition) and those films easily stand apart in sensibility from the flash-bang spectacles that rake in the summer money. So where are comics heading next? I predict they will continue to ride along behind Hollywood for a while longer until fickle audiences tire of it and some new movie sub-genre comes along to get the studio execs clamoring to imitate each other. Comics will bottom out again, and again make the climb back up. As to what paradigm shift will spark the next resurgence, who’s to say. You’ll hear some talk about comics on the web, but until there’s broadband in every home the Internet just isn’t the best delivery method for a medium centered on imagery. I don’t think comics will ever die completely. There’s just something magical that happens when words and pictures meet in the human brain, something that no other medium can synthesize. The Internet will continue to distract us from the printed page. Movies and video games will continue to outshine still-frame panel-to-panel storytelling. But some innate hardwired instinct will always bring us back to the comic book. I’m looking forward to the next boom, and in the meantime I’ll keep my foil-embossed Silver Surfer vol.3 #50 polybagged in a cool, dry, light-proof place with its acid-free backer board. Just in case. This was posted on Thursday, October 14th, 2004 at 2:00 am	and is filed under General Geekery. Comments closed, no pings allowed.